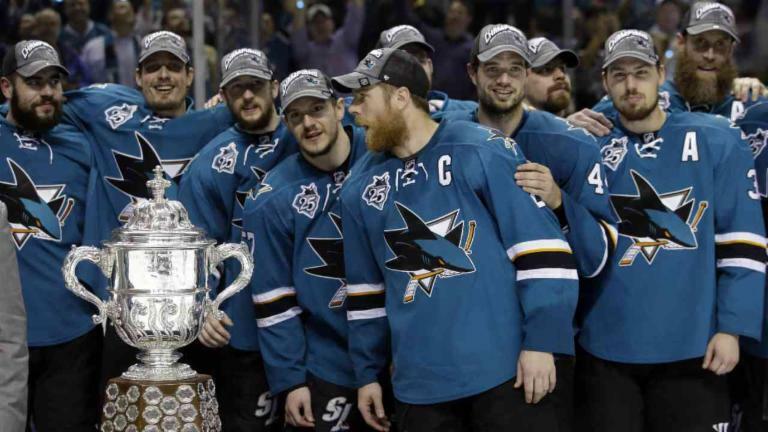 (The Sports Xchange) - The San Jose Sharks are going to finish their silver anniversary season chasing that big silver chalice. The Stanley Cup Final is coming to San Jose. Joel Ward scored two goals and Martin Jones stopped 24 of 26 shots as the Sharks eliminated the St. Louis Blues with a 5-2 win in Game Six on Wednesday. Joe Pavelski, Joonas Donskoi and Logan Couture also scored in the clinching game for San Jose. By virtue of winning the Western Conference title, the Sharks advance to their first appearance in the NHL's ultimate series. San Jose will open the Stanley Cup Final against the winner of Thursday's Game Seven between Tampa Bay and Pittsburgh. Ward scored his second goal of the game and sixth of the playoff series at 3:01 of the third period by deflecting a Couture feed past Blues goalie Brian Elliott. Donskoi iced it with his fifth goal of the playoffs at 8:11 from another pass from Couture, who capped a three-point night with an empty-net goal with 19.7 seconds left. The Blues snapped Jones attempt at a third shutout of the series when St. Louis' regular-season leading scorer Vladimir Tarasenko finally registered his first point of the series with a goal at 11:39 and scored again with an extra attacker at 16:25. The Sharks scored the only goal of the second period to take a 2-0 lead into the third. Ward gained inside position on Blues defenseman Alex Pietrangelo to redirect a soft wrist shot by Sharks defenseman Brent Burns from the right point past Elliott at 5:02 of the middle period. The Sharks scored the only goal of a first period. Pavelski scored his NHL playoff-leading 13th goal on a wrap-around at 3:57. He outmuscled Pietrangelo to backhand a shot along the ice as Elliott couldn't keep his left pad tight against the near post. The goal came following a close call for the Blues moments earlier. Center Paul Stastny fired from the mid-slot, but Jones got a piece of it and San Jose center Tomas Hertl quickly moved the puck to Pavelski, who tapped it at center ahead to Joe Thornton. Thornton broke in alone on Elliott, but his drive went over the cage. Thornton outworked Blues defenseman Jay Bouwmeester to make a short pass to Pavelski, and the San Jose captain did the rest.